Written by Jud on August 25, 2006 to Roxette. Roxette celebrates 20th Anniversary with a new single, a greatest hits and the definitive box set. In the spring of 1986, Per Gessle and Marie Fredriksson decided to record the dance pop single “Neverending Love.” They called themselves Roxette, and it was the beginning of a fantastic career which now spans 20 years - and this has to be celebrated! Roxette has sold over 45 million albums and 25 million singles since the international debut in 1989. During extensive worldwide tours, Roxette has visited every corner of the world, performing to more than two million people. Roxette’s singles have topped every chart in the world including the Billboard Hot 100, where they’ve had four #1’s: “The Look”, “Listen To Your Heart”, “It Must Have Been Love” and “Joyride”. Furthermore, two of their songs reached #2 on the same chart: “Dangerous” and “Fading Like A Flower (Every Time You Leave)”. In 2005, Per Gessle was honored by the American music publishing organisation BMI with an award for four million airplays of “It Must Have Been Love” from the classic movie “Pretty Woman.” Four million spins, on US radio alone, equals 36 years of nonstop airplay. Statistics show that the song is still so popular that there are always at least two American radio stations playing “It Must Have Been Love” around the clock. It’s hard to find a better definition of the word evergreen. 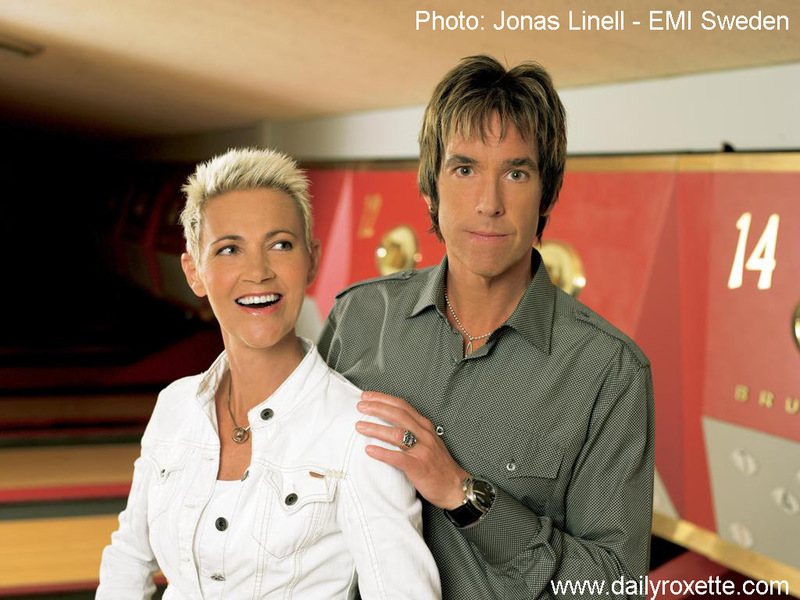 In 2002 Roxette was struck by tragedy when Marie Fredriksson was diagnosed with cancer. After extensive treatment and re-habilitation, Marie is now fully recovered and slowly getting back to recording and performing again. To celebrate their 20th Anniversary, “Roxette Hits!” will be released on October 18. The album features all their major hits and two brand new songs, which were recorded in Summer 2006, “One Wish” and “Reveal”. On October 4, “One Wish” is released as the first single from the album. The song starts its airplay on September 20. “It was great to work with Marie again! We had three fantastic days down in Skåne and we are very happy with the result. Everything was very easy, Clarence played keyboards, Marie prepared some coffee and Christoffer and I played hockey. I won,” comments Per. “The RoxBox ’86-’06” includes 4CDs featuring all the hit singles and best album tracks, two new songs, rare recordings, demos, and much more. Included in the box set is also a 3-hour plus DVD with all Roxette’s video hits and the previously unreleased complete Roxette MTV Unplugged TV show. The first promotion picture - which you can see to the right - has also been published. Taken by Jonas Linell at the video shoot for “One Wish.” Click on it to enlarge! Wow, One Wish & Reveal! Very promising titles! So there definitely will be a video for One Wish. That’s great news too. I think that proves that Marie does feel a lot better now and that she is having fun. Lovely photo, by the way! Finally some new Roxette news the drought has ended and the celebration is starting. One Wish and Reveal sound like very modern titles and I can’t wait to hear what they sound like. Hopefully there will be some 30 second snippet or something so we can finally hear what One Wish will sound like! Personally I am saving up to buy everything that Roxette are going to release in this period - every version of everything they are going to release..........I can’t wait. Btw I also think that a worldwide promotion of Roxette to do with iPod like some people suggested on another post would be a great way for Roxette to gain success and possibly expose their music to a whole new generation of fans to coincide with the 20th anniversary. From an excited Roxette fan in Australia.......Yes Roxette you still have fans in the land downunder. oh and the titles of the other songs on the cd’s? Heeeeeeeeeeeeey, “One Wish” will be released on my birthday!!!!!! Well, finally a little bit more. I like the picture, they both look great. And who doesn’t touch up stuff these days. But I thought the airplay would be before. Great news, nice picture. Looking forward to the releases. Now when so many details about the rox20 are out, maybe an update of Roxette’s website would be the next thing to do? October 4 is a Wednesday, so this seems to be the release date for Sweden - any idea about the rest of Europe (not even going to ask about other countries...)? I’m guessing October 6 for Germany and October 9 for most of the rest of Europe? When was Marie’s gap fixed? The pic is great, even if it doesn’t look like a picture of an official photoshoot. gap fixed since crashboombang, I thought. THE BIG DREAM COMES TRUE!!! Great to get some more info, can’t wait to hear the new material! I like the title of the second song! Gorgeous Photo!!! Wanna see more!! Can we quit September?? Wanna have Oktober already!! Is that really happening? Oh my, I’m so happy that I’m almost crying with joy. The picture is just amazing. It’s somehow “uplifting” to see them together (on a picture) again. Lovely pic, I can’t wait to hear the single and see the video! Wowowow!!!! I think I have everything in my colloection so....it’s going to be new material!!!!!! Bad news, it seems the new video is not goin to be in the BOX-DVD. 20 Sept –> Bufff......what a longer month waits for me!!! this is just great! i love that picture, they both look really good. revel sounds promising. what else can i say? i can´t wait for october to come! And where are now those who said that Roxette is over???????? After looking at the high resolution picture I have to correct myself in saying there was a lot of retouching work done ... It’s more make up than digital retuching in their faces, I guess. Ahhhh, another tidbit to keep us salivating (TimBit for the Canucks (-: ). Given that the official press release is out only now, I think we’re lucky to have known the single’s title so far in advance! In any case... 26 days to go!!!! Wowwwww!!!!! beautiful pic, I am the happiest woman of the world!!!! I believe that I am going to cry... shout ... oh my gosh......... Rox I love You Marie & Per!!!!!! maybe this photo should be the substitute for the “Real sugar-¨promo” photo in the sleeve of The Daily Roxette... what do you think about it? ths sunshine is a lady who rox you like a baby. I´m loving everything. The picture is great, the song titles are great, the Rox Box sounds great. Can´t wait to hear the whole song. Here we go. I’m getting more and more curious and excited about the RoxBox. That’s just great. Let’s party!!! IT’S A FANTASTIC PICTURE!!! MARIE & PER TOGETHER = ROXETTE ARE BACK!!! EVERY TIME I TELL YOU! EVERY TIME! I leave TDR alone for the day, and something good happens, typical! Damn, brain not working- great news guys! Good news and one hell of a picture. God, how gorgeous they look! This is a moment I didn’t dare to hope for since the tumor issue. I thought I’d never see them together again! To make it short: WOW! Thanks to all involved. puh so finally I can celebrate.. I only had time to put this up this morning in between two meetings at work.. Thanks for your outstanding work and engagement. You’re doing an absolutly great job!!! oh my God, I am so happy about the news !!! Both are looking so brilliant !!! Thanks Marie and Per !!! I LOVE YOU !!! I’m really really happy about this news!!!!! excellent photo!!! guau!!!!!!!!!!!! No words to explain,I LOVE THEM!!! 20 years and 20 kilos of foundation on them. Congratulations to the make-up department for making them look like terracota figures. If “One Wish” is an uptempo track, should I assume “Reveal” is a ballad??? Usually on official pictures you don‘t look like being just pulled out of bed, so please stop moaning obout terracotta-retouch-makeup-wax-whatsoever-details (c‘mon, they‘re not 20 anymore) and enjoy the pic! Yay!!! Great news and great picture!!! @Joyrider: Is it so important if the picture is retouched or not? Marie and Per looks great! Better than Botox like Madonna. She looks like Mrs. Jackson! Nobody is moaning about the makeup, just kidding I guess. Don’t be oh so serious! Of course it’s a great pic. Both looks great. It´s great to see Marie smileing again. She looks same as she looks before her illness, if not better. If I remember pics from The Change times, I must say that this is stupendous change. She looks healthy and happy. Per looks also good. This posture, Per behind Marie with hand on her shoulder, reminds me pics from around 1991. No deal with retouching. They are almost 50. Little help can´t harm. As I said, Rox looks great but if this is one of these “great pictures from Alley”??? It has no conception, no art. Sorry. TDR bowling single sleeve looks cooler. sure looking forward to “One Wish” and “Reveal”, and yes, agreed: it’s gret to see Marie smiling again! In fact they both are looking GREAT! BTW: Why is Rox news on SOAP site? There´s no news on Roxette.se. Gyllene Tider had a great promo site, Gessle (soap) as well. Most likely Roxette also will get one soon, or? But, it’s strange to have Rox news on SOAP site. And hope that Reveal will be released as a single. Somewhere around christmas or in the Jan 07. Wow - finally some more info and a pic!!! It’s great to see Marie with huge smile and both of them together. Love the pic, hopefully there’s more to come, and not in the “classic” Per behind Marie with a hand on her shoulder pose. Oh and i can’t wait to hear Reveal, such an interesting title. It’s very nice to see them together. I just love that picture. Marie looks soooo happy! I also like the bowling thing, and the clothes... if this is going to be the “concept” for the hole 20th anniversary stuff, then I really like it. Iaiiiiiiiiiiiiiiiiiiii!! It’s sooooo fantastic. The news are fantastic, the picture is fantastic, the songs are fantastic.....It’s a fantastic day!!! it´s a dream comes true to see them together again!!! They are soooo beautiful! That picture is frickin gorgeous. I tell ya what, ol’ Per ain’t lookin too bad. Look out Åsa, reeeooow!! In fact, there is a news section in roxette.se. Just go to the bottom of the text and there it is. About the picture... yes, it´s too much “natural” for my taste. A bit of glamour (like used to be) would be welcomed. wow - great pic - Per is looking sooo good - they both do - the news is all exciting!! @britnito, Yes, I think I’ve seen Marie wearing that jacket (or a very similar one) before. Obviously they spent most of their budget on make-up, so there was no money left for clothing. I love the watch Per is wearing. Nice shirt, Per! ;-) and Marie looks so good! A day and night have passed since we got the news and I still can’t pick up myself from the floor after seeing the pic! *drool*. They both look relazed, fresh and amazing! reveal sounds promising as a title. @britnito: How do you mean?? I love her in this hugo boss jacket. She looks really cool in it!! Well, she wore it during her promo for “Min bäste vän” ;) I like it. WHY DO YOU LIKE SO MUCH THE PHOTO!!?? I KNOW THAT IT´S THE FIRST PHOTO TOGETHER AFTER A LONG PERIOD BUT FOR ME IT IS REALLY BORING... NOTHING THAT TELL US THAT IT´S THEIR 20TH ANNIVERSARY!! >> That picture is frickin gorgeous. I tell ya what, ol’ Per ain’t lookin too bad. Look out Åsa, reeeooow!! lol, sparvöga, you bet he does look good, mmm, they both do! And this pic in “king size” makes you cannot take your eyes off it. *dreaming* and waiting for more! GREAT PICTURE!! I´m very tense of more!!!! I LOVE THE PIC!! !I know,no glamour but it looks so natural!! I’ve got it on my movil phone,i can’t stop to watchin’!! I’ve shown the pic to my workmates and they thought that the pic was old,when Per & Marie were younger!THEY LOOK AMAZING! October 18th is already highlighted in my agenda! It´s feel so great to see Marie & Per together, both look´s so nice and young!! Marie looks so great - it’s nice to see them together after all this time. Can we take it from this that the CD has been renamed from A Collection of Roxette Hits - Their 20 Greatest Songs!, to just Roxette hits? 2 ncurran: Do you remeber “Love Peas - The Ballad Hits”? I thing that these simply titles are better. @wonderful: yeah, that’s what I’m hoping too - that unplugged will include the outtakes... but on the other hand it doesn’t sound too likely - if the DVD TOGETHER with all the videos is going to be 3 hours long. Hopefully I’m wrong! ick i just realized the video for one wish is being shot in a bowling alley? According to what Per just said on Nordic Rox there’s a slighty chance that they play One Wish a couple of days earlier than September 20.
:) This is a great way to premiere a song!! Worldwide!!!!!! After the coment they played Drowning in Wonderful Thoughts About Her. Edit: He was named as “Turboman” after a The Sounds’ song. Hey Hey Hey, it´s Saturday! Wow! I wish I had Sirius so I could listen to the world premiere of “One Wish” on NordicRox - great idea, Per! How about a 30sec clip on the site right about now? Give your fans something and don’t treat them like the rest of the crowd, I mean we at least make an effort to visit the site...why should we hear it at the same time as the rest of the ’normal’ public? I say make us feel special and give us a clip at least! IT´S SO GREAT. IT IS WONDERFULL TO SEE THEM TOGETHER AGAIN. IT IS AMAZING..IM SO HAPPY. :D FOR THEM , FOR MARIE. FOR US!!!!. THE BOTH LOOK INCREDIBLE PRETTY ON THIS PICTURE!!!!. GOD SAVE ROXETTE!!!! !...OR AS WE SAID IN ARGENTINA...AGUANTE ROXETTE!!!!!!. IF THERE IS SOMETHING UP THERE IT HAS LISTENED!!! THIS IS A GIFT !!! THANKS TDR!!!... :D :D :D.
I think this is Great News and also a Great Picture! Made my day! amazing picture! I still can’t believe that it’s really happening now! I like the picture.... touched up though! Now that I’ve seen the tracklist, “a special treat for true fans who thought “they had everything [in their collections]” sounds like a bad joke! Hello, wake up, Per! This is anything but a special treat!